Living in Central Alabama, you are well aware of how quickly the weather can change. 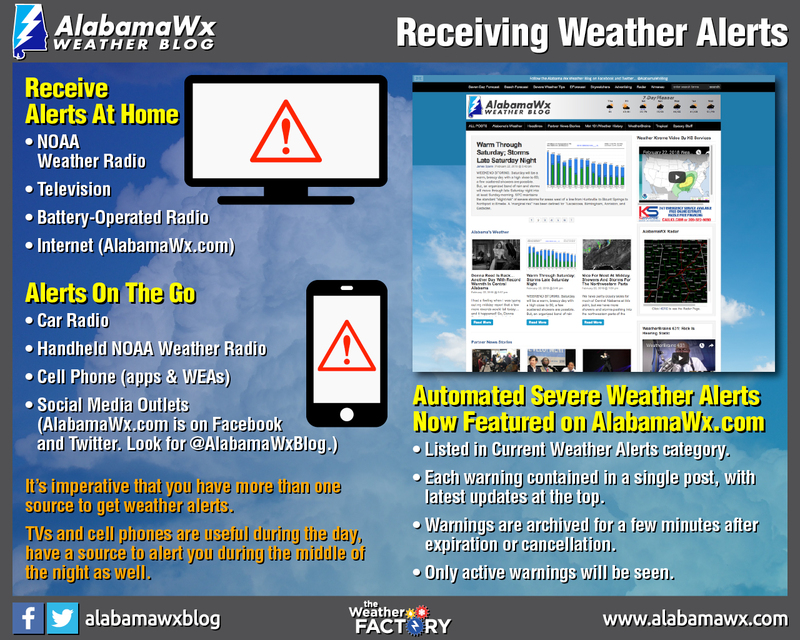 You have seen all of our posts about each severe weather event, now it’s time to see how you can receive the information from a trusted source. It is critical that you have a reliable way of receiving severe weather watches and warnings immediately. Lead times for tornado warnings have increased dramatically since the implementation of Doppler Radar, and false alarm rates continue to drop. Prior to 2007, severe weather warnings were only issued for entire counties. In 2007, the National Weather Service adopted Storm Based Warnings, which generally cover areas smaller than a county. Now, National Weather Service meteorologists issue tornado or severe thunderstorm warning for narrowly defined areas where they believe a tornado or damaging severe weather event is occurring or will occur. Contrary to popular belief, it doesn’t happen very often. In fact, there are only two tornado warnings on average per year for any given location in Central Alabama. So when they are issued for your specific location, take them seriously and act! NOAA Weather Radio is the old standard. When a watch or warning is issued by the National Weather Service, specially built receivers are automatically activated by radio signal and sound a loud alarm. They can be programmed to alert you only when certain counties are affected. One drawback is that they are designed to warn entire counties, not the very specific areas included in the National Weather Service warnings. But Weather Radio is robust, reliable way of getting the message when severe weather threatens and should be part of your redundant ways to get warnings. Outdoor sirens are designed to warn people who are outside that there is a tornado warning. They are usually sounded countywide, rather than just in areas where the warning is in effect, which means a lot of false alarms like Weather Radio. And they generally can’t be heard indoors and won’t wake you when you are asleep, so don’t rely on them as a primary line of defense in your severe weather safety plan. Wireless Emergency Alerts (WEAs) is a free notification service on most new mobile devices. It’s automatic and there is no need to enroll. When the NWS issues any tornado or flash flood warnings, cell phone towers will broadcast the alert to those users in the threat area. The only drawback is that it doesn’t alert for severe thunderstorm warnings, which we know can also be a threat to life and property. If you have an iOS or Android device, we strongly recommend WeatherRadio by WDT. There is a one time cost of $4.99 for the app. The app enables you to receive critical alerts via voice and push notification regarding life-threatening weather events. You can set it to where you only receive alerts for where you are currently located or get warnings for up to 5 different locations. Also, the AlabamaWx Weather Blog now has automated weather alerts posted to the site and will be listed under the category Current Warnings. Each warning will only stay on the blog while it is in effect, and will be contained in a single post with the latest update at the top and all the other information from that warning listed below. A few minutes after it expires, the warning will be archived, so you will only see current warnings in that category.